The number one fundraising cycling series in the nation. Bike MS raises more money than any other cycling event for any other cause. To date, Bike MS cyclists, volunteers and donors have raised over $1 billion so people affected by MS can live their best lives as we stop MS in its tracks, restore what’s been lost and end MS forever. Every great team starts with a strong team captain. Once you’ve registered as a captain, ask your friends and family or co-workers to join you. The more people you have, the greater your impact and fun. Plus, it’s always easier to have someone to draft behind! You’d be amazed at how many people already ride Bike MS. Ask around at the office or local bike events and find a team you can be a part of. Once you’ve gotten the okay, find the team online and register. Then get ready for the experience of a lifetime! Some of us are just meant to go it alone. But you won’t be. Even if you ride without a team, you’ll find many riders to team up with for fun and support along the way. And our volunteers will make sure you have everything you need to keep pedaling. It’s not that you don’t want to ride. You’re in it for the cause. Sign up as a virtual rider and you can share in the experience and fundraise your heart out. Fist bump. The earlier you start, the more ways you’ll come up with to raise funds. There’s the straight ask, the social media blitz, the fundraiser inside a fundraiser, and more. Once you get started, you won’t want to stop. Take the lead people will give to you once you’ve shown your own commitment to the cause by donating to your own goal. Give your fundraising thermometer on your page a kick-start! Fill it up! Know the #1 reason people will give? Because you’ve customized your fundraising page. Take the time to tell them who you’re riding for, or the personal challenge you’ve set for yourself, or the really important breakthroughs we’ve achieved in MS research and treatments in the last 20 years. If it matters to you, it will matter to them. Once you’ve customized your page, kick it into high gear. Send emails. Tell everyone you know. Download the Bike MS mobile app and Facebook app to do the work for you. Each Bike MS ride is unique and extraordinary. Pedal through the coastal towns of New England. Ride through closed off streets of New York City. 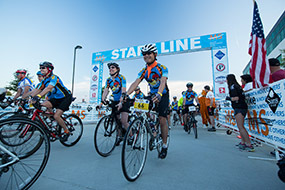 Or finish 150 miles of fun at the largest bike MS event in the country, the BP MS 150, from Houston to Austin, Texas. With 100 rides from 15 to 150 miles all over the country, there’s a ride for everyone. Find one near you or ride somewhere new! What’s Bike MS like? It’s extraordinary. It’s life-changing. But don’t take our word for it see what others think. Bruce “Slowride” Reid has ridden Bike MS in all 50 states. Al DeRitis never loses sight of his goal all year long. Meet cyclists and fundraisers that use their personal passion to fuel progress. Bike MS sponsors share our collective passion for cycling and making a difference for people affected by MS. Check out their products and special offers for Bike MS participants and share the love right back.